Disclaimer #1: For the recap of our trip, I will probably not be doing my normal Now and Then format. I am already behind on my updates and want to concentrate on telling you about our vacation. Disclaimer #2 – Tomorrow is supposed to be No-Twin Tuesday. For same reason as above, it will not be….but the No-Twin Tuesday will return next week. Thanks for reading! And for understanding! NOW: Oh boy. Ok, it could have been worse. A lot worse. 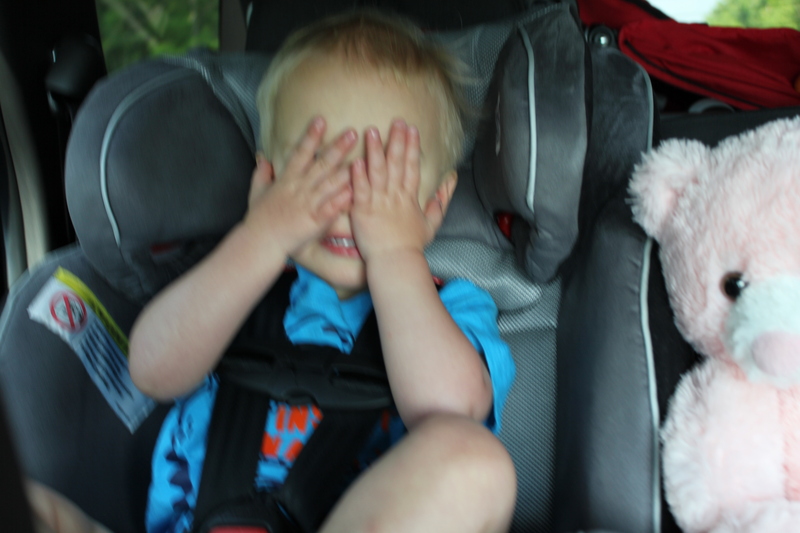 There were no major meltdowns from either 2-year-old stuck in the car for the 7-hour drive to Sesame Place. Well, not even Sesame Place, just the hotel. However, they were just whiny enough to add approximately 4 hours onto the trip. Not too bad, really! Mommy made sure to start her day with an iced coffee. Around the hour-and-a-half mark, Will started whining. This was obviously expected. Luckily, on the 90 through NY there are several pull-off service stations. Mommy got another iced coffee from Tim Hortons, and twins got Timbits. As a mini-snack and a bribe (for later). We let them walk around the service station for a bit to stretch their legs, and then got back in the car. Another hour later, we stopped again and had a snack at another service station. I guess sitting in a booth is somehow vastly different from sitting in the car. And looking at the cars out of this window was so much better than looking at the ones out the car window. 🙂 We led them out, barely able to contain them. They were so so so excited already. What an adventure! 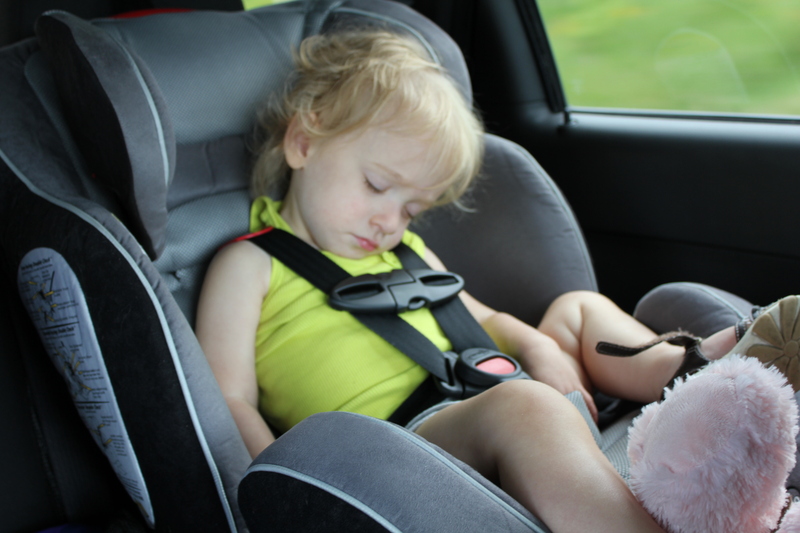 Daddy did a great job of keeping them entertained when necessary from the passenger seat. From propping up bears to look out the front window……..
…….or understanding that when Will yelled “ARE YOU? ?”, he was wanting to play hide-and-seek. It really worked out well that Tim was the passenger because I often get carsick if I have to turn around. 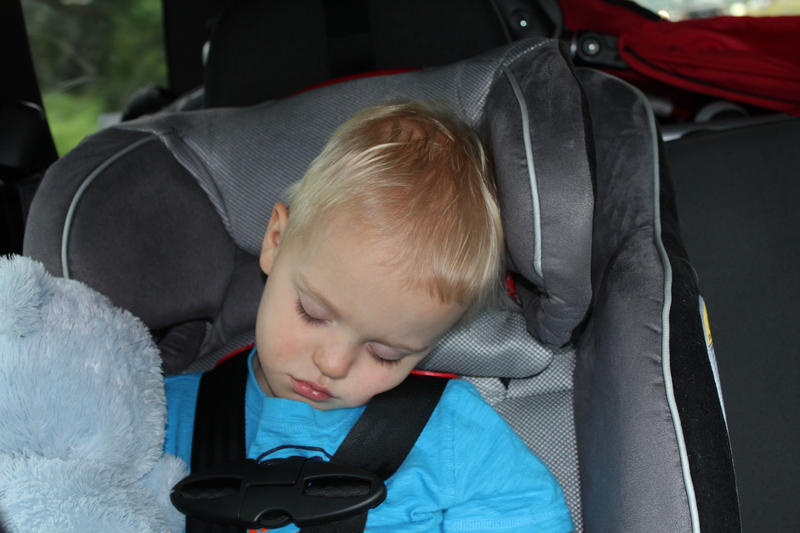 The twins both fell asleep about 45 minutes before Syracuse. 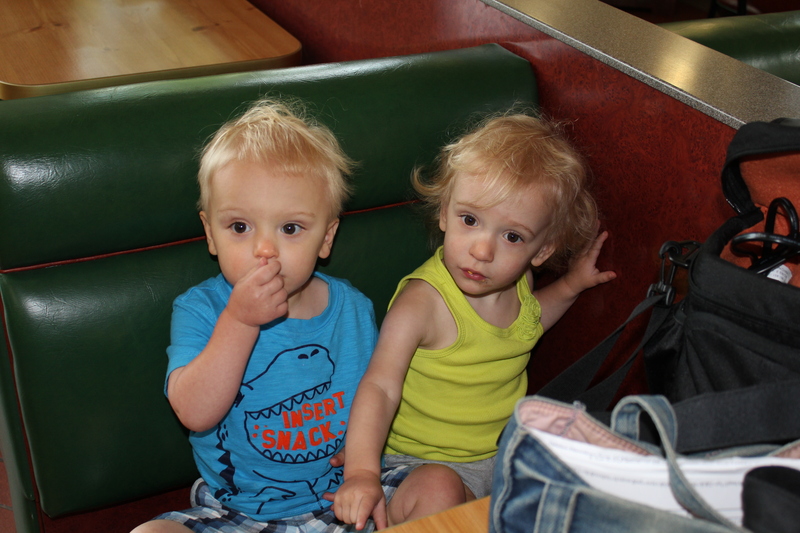 Luckily, they woke up just as we spotted an Applebee’s off the highway……there weren’t too many more restaurants after that. We knew right away what to order for Ariel….shrimp and french fries off of the kids menu. We got chicken tenders and fries for Will. They don’t often have french fries, but are obsessed with them. Unfortunately we didn’t realize the shrimp was fried. Ariel didn’t touch it. She and Will did share the chicken and the french fries though. (The Count’s French Fry Count: That’s 1, 1 meal with french fries, ah, ah, ah). We got back on the road and only stopped at one more rest station. There were none in the rest of NY, although it wasn’t a toll road anymore. The toll to go across NY? 6 bucks. The toll down to Philly through PA? 80 cents…….another 80 cents…….then 11 dollars more. What the heck! And there were only 2 rest stations (the kind where you don’t have to exit and then get back on). So, Mommy got Starbucks, babies got diapers changed (we were not dealing with potties on the car ride), and we got back in the car. 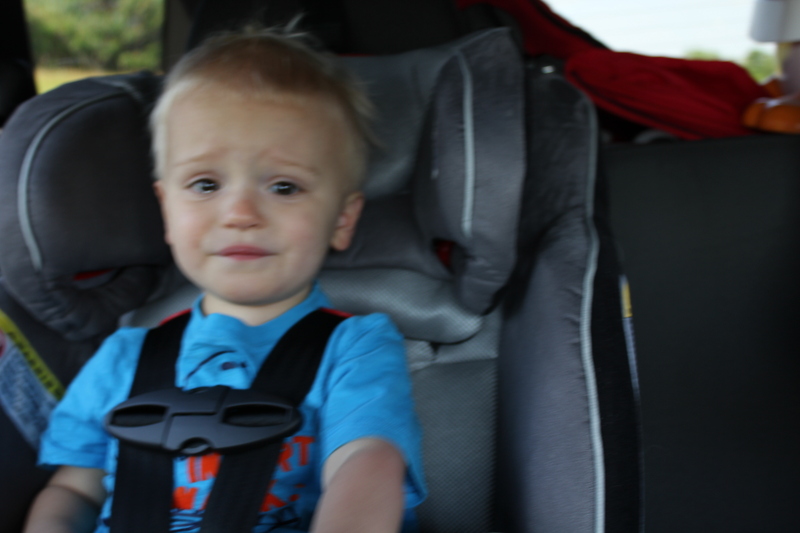 As we were approaching Philadelphia, babies started whining again. Rightly so; it was way past dinner time by now. Almost 7:00, when we usually eat at 5:30. Daddy tried to calm them down with the stash of Timbits but they weren’t really interested. We didn’t really know a good place to exit in Philly and there were no restaurant signs, and trees blocking the neighborhoods, so we didn’t want to risk it. We decided to keep going until we got to our exit and then if we saw something before the hotel, we’d stop there first. 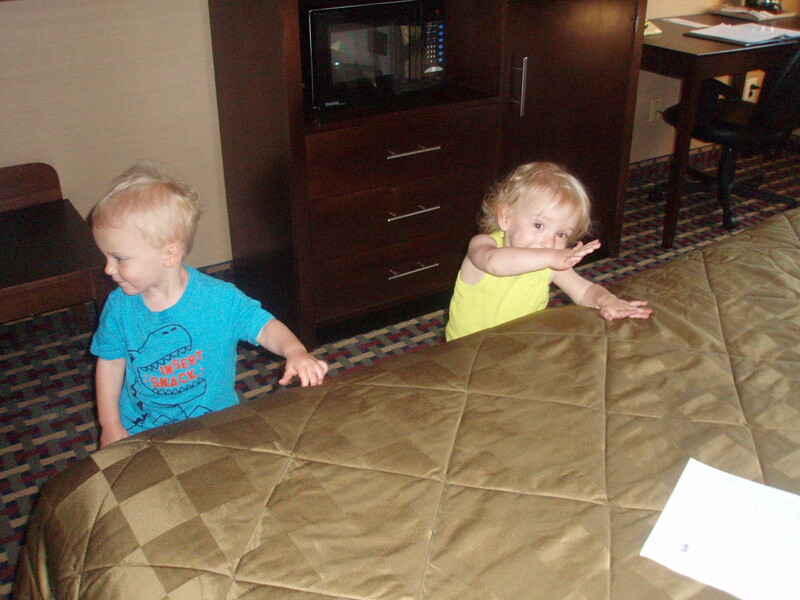 We ended up getting to the hotel, getting our stuff inside (thank you Daddy), and asking the front desk for suggestions. The twins were so excited to be out of the car and someplace new that they almost kinda forgot about being hungry and were just running around the hotel room like maniacs. They figured out right away where the bathroom was. And knew the pack-n-plays were their cribs. 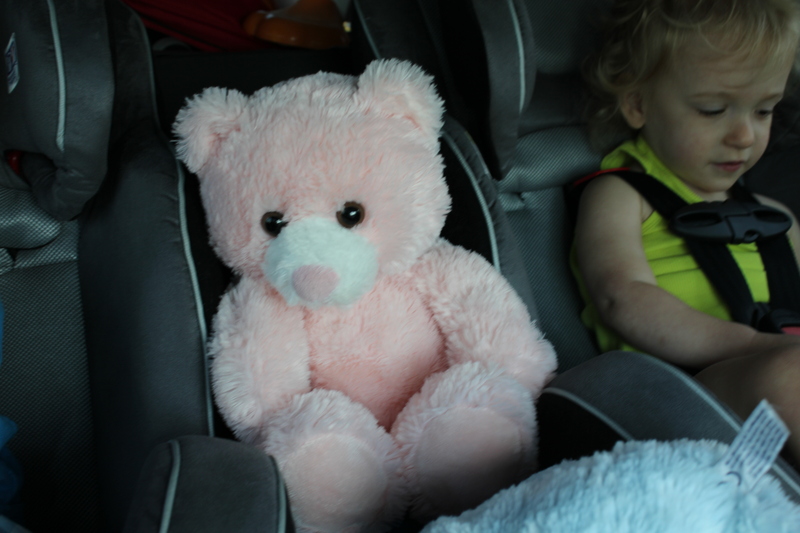 I put their stuffed animals from their cribs at home inside right away so they were familiar. When Tim was done bringing up the luggage we left again to drive to dinner. We decided on Olive Garden. It was all about familiarity for the kids at that point because we knew they were “starving”. So pasta and pizza seemed like a good choice. It was another 15 minute ride….made all the much longer because you could not make a left turn to save your life in the town. How ANNOYING! All the way there Will kept saying “almost almost almost dinner almost almost”. But not in a whiny way, just a reassuring way. What a trooper. We ate and headed back to the hotel. They ran around for a bit (don’t know how they had the energy 3 hours past bedtime) while I got things ready for our first day at Sesame Place so that I wouldn’t have to waste time in the morning. Tim and I decided we’d put them to bed, then take showers while they fell asleep and then we’d go on the computer or read by flashlight for a little bit before going to sleep ourselves. Ariel started screaming bloody murder as soon as she was in the pack-n-play and the lights were off. We had obviously expected SOME sort of reaction to sleeping in a strange place, but this was a little much. Tim tried to calm her down while I ran into the shower. When I got out, he went in, and I tried to soothe her. I sang “Twinkle Twinkle” and the Sesame Street Theme Song over and over and over and over and over and over again until she finally laid down and I could hear her even breathing. By then, Tim was pretty much asleep. I laid down also…..but was kept awake another hour or so by Will constantly shifting to become comfortable. He finally settled down around midnight. Around 5:30 AM Ariel woke up screaming and I reassured her that we were all still there. Prior to that, I had been woken up half a dozen times by her whimpering. That, and the fact that I had to go to the bathroom but didn’t dare get up and risk making any kind of noise. Later, I found out that Tim had had the same issure during the night. At 7, Will woke up and started saying “dister, dister” to Ariel, which of course, set her off again. That was the end of that. We had hoped to sleep until 8, but oh well. This is now.